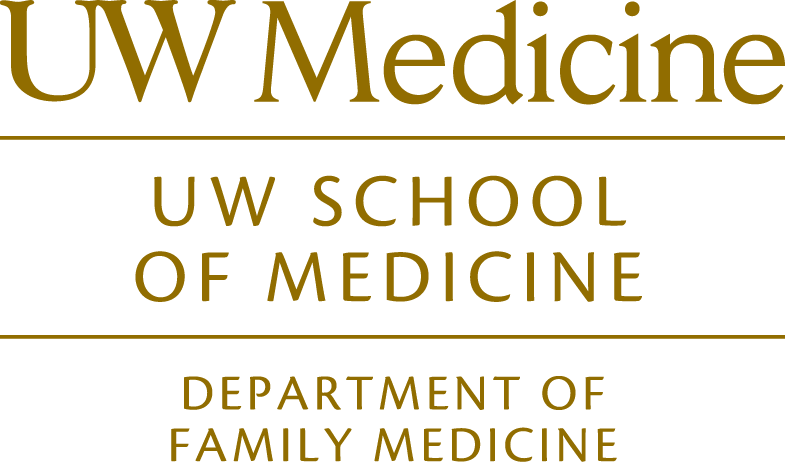 The UW Family Medicine Interest Group is part of a national network of FMIGs that is sponsored by the American Academy of Family Physicians (AAFP). The national network allows students great opportunities in regional and national leadership in addition to leadership within the local FMIG. In addition to the AAFP, most states also have their own chapters. The associated philanthropic arm of the WAFP, The Washington Academy of Family Physicians Foundation, generously provides funding for our FMIG. The King County Academy of Family Physicians (KCAFP), the most active country academy in the country, also supports our FMIG. The FMIG is overseen by the Faculty Advisor, Jeanne Cawse-Lucas, and coordinated by the Program Coordinator, Ivan Henson. Student leaders are self-selected at the quarterly leaders meetings; anyone can show up as an interested party and become a leader. Some projects require a larger commitment in time and effort (mostly the service projects), while other one-time events are less involved. We try to align clinical skills workshops with the academic calendar so students can practice skills that they are learning in class. The quarterly planning meetings occur close to the start of each quarter. This is when the FMIG discusses the events they will plan for the quarter, and when leaders will self-select projects they’d like to lead. For the most part the programming is standardized quarter by quarter, but any new programs or changes to existing programs/offerings are discussed as well. The faculty advisor usually leads the group. The meetings take place at lunchtime when both first and second years are available along with the FMIG Faculty Advisor and FMIG Coordinator. Light snacks are provided at the meetings – usually some crackers, hummus, fruit, veggies, cheese, nuts, etc. works well – consult the budget for spending allowances. A meeting agenda, including all events and information for the upcoming quarter will be sent out ahead of time for recruiting students. The FMIG Brown Bag discussions began as a way for the FMIG to gather informally on a more regular basis than the quarterly planning meetings. Guest speakers are invited to talk about various topics in family medicine. These lunchtime sessions should be scheduled when the FMIG Faculty Advisor is also available. Students bring in their lunches and come to discuss whatever they want – related to family medicine and/or FMIG, of course. At least one of these should be scheduled for each quarter. The topic-based brown bags are a great opportunity for faculty, residents, and community physicians to meet eager MS1 and MS2 students and to share a specific interest with them. Brainstorm with the faculty advisor for a list of potential topics and speakers to contact. Usually students give suggestions of topics that interest them at the quarterly planning meetings. The Brown Bags take place during lunch on days when both MS1 and MS2 students are free as well as the FMIG Coordinator. Free parking is arranged for the speaker when needed. The speaker will provide a short biography and a blurb about their topic to include in advertising the events to the students. What is a Family Doc? This event is a requirement for the AAFP FMIG Funding initiative and needs to be completed and all supporting documents submitted by December 6th. We usually do this during National Primary Care week. The event occurs in the evening, (Mon-Thurs) either 5:30 – 7:00 PM or 6:00 – 7:00 PM, depending on when panelists can arrive and when MS1 and MS2 schedules permit. Students can send the invitation to panelists if time allows, but oftentimes the planning starts before student leaders are identified so the FMIG coordinator will invite panelists. Food – the budget for this event is more substantial because it is popular. Student leaders can help plan the food. Create a WeJoinIn for RSVPs – Allow as many students as possible to attend. As the date gets closer you can see how much food will be needed. See “AAFP Funding Initiative” below for specifics on planning for the grant. Arrange parking for the panelists. Book a lecture hall through Classroom Services and order a table to be delivered outside of the room for food service. The AAFP offers a $600 grant to all FMIGs through the FMIG Funding Initiative (you can find details and the necessary forms online). Part of the application includes administering a pre and post event survey – we do this for What is a Family Doc? Recreate the survey given by the funding initiative via Catalyst tools (it can be copied from a previous year, but the questions and scales may need to be updated accordingly). Send the survey to all students signed up to attend the event at least 1 week prior. Part of the survey asks students to identify questions they have about family medicine for the panelists – collate these questions by topic and consider sending them to panelists to give them a better idea of what students are interested in hearing about. Have the leaders write thank-you notes to all of the panelists. PHC is an annual event held in the Tacoma Dome Exhibition Hall that works to connect people experiencing homelessness with resources and services available to them, all in one place. There’s everything from medical care, dental care, and haircuts to unemployment services. FMIG students volunteer to conduct all of the intake/triage for the medical area, usually reaching more than 300 clients in one day. All volunteers must attend the PHC Orientation. Leaders identified at the autumn quarter leaders meeting are responsible for advertising the event, and the coordinator should ensure that the leaders have all of the necessary information to do so effectively. Students should know their ENTIRE responsibility when signing up for the project (i.e. attending orientation, traveling to Tacoma on a specific day, perhaps missing class). The orientation and Vital Signs Workshop should be scheduled by this time, as attendance is necessary for participation in PHC. Students will sign up for shifts (AM or PM), which will be decided once the official hours of the event are released. It’s helpful to help coordinate carpools, too, as many students do not have cars. 10 Sharps Containers Typically provided by Health Dept. – confirm this! Once each week free coffee is offered outside of the lecture halls for first and second year students, courtesy of the FMIG. Donations are collected to benefit a local organization that is identified at each leaders meeting. Also with the cart is a list of upcoming FMIG activities. The FMIG Coffee Cart does a few things: raises awareness of FMIG and upcoming events among the students, raises awareness of a new organization/issue each quarter, and raises money for a given organization. It is a great way to build community and advertise FMIG! The AAFP Funding initiative contributes funds to purchase coffee, creamer, tea, and cups, and some years student leaders take turns making home baked goods to give away with the coffee (leaders coordinate the baked goods themselves). The FMIG Coordinator is responsible for making sure the cart is fully stocked with supplies and for actually setting up the cart and making coffee (this means buying soy milk and half and half fairly regularly!). The students pick up the cart from the office and return it afterward, and the FMIG Coordinator keeps and tracks the donations over time. The FMIG coordinator is responsible for cleaning up the cart when the students return it in the afternoon. At the end to the quarter all donations will be counted and brought to a local charity (determined by student leaders) with a donation letter written by the FMIG coordinator. National Primary Care Week is an annual event put on by the American Medical Student Association (AMSA). The FMIG partners with other student organizations on campus (The Pediatric Interest Group [PIG] and Internal Medicine Interest Group [The Osler Club], SNMA, and Patients for Social Responsibility [PSR]) to offer events related to primary care. Prior events have included a physician panel, brown bag discussions, film showings, and a primary care social on the Affordable Care Act. Various organizations will likely contact either students or the FMIG coordinator to get a spot on the calendar for NPCW. Some of the planning can be done in August prior to students returning, and students can take over once they’re here. Prepare for these events much like any others – see what the budget allows for food, book rooms, set up parking for any guests, etc. Also make sure that the other student organizations contribute money (they usually do) and coordinate the division of payment. This program runs every quarter and requires very little effort on the part of the FMIG coordinator. Students sign up to carry a pager for one week at a time and are paged to shadow deliveries with the UWFM residents. The beeper changes hands on Mondays and the coordinator’s job is to facilitate its return and check it out to the next person. There’s a sign in/out sheet that goes with the beeper. The beeper registration expires each August and the bill will come in the mail. Student leaders create a WeJoinIn each quarter so people can sign up for specific dates (see prior sign-ups as an example). The leaders are responsible for advertising and actually signing students up. Schedule the orientation for sometime during the first week of the quarter for a time when all MS1 and MS2’s are available. Student leaders need to ensure that the baby beeper paperwork is updated and that the packet is ready to go. Students pick up the pager in the afternoon on Monday and return it the following Monday morning. The coordinator makes sure that the battery is charged and that the paperwork is complete and with the packet. The students will sign the packet/pager in and out via the sign in sheet. Training takes place autumn quarter and is organized by past student leaders. Presentations take place throughout autumn, winter, and spring quarters. Tar Wars is a tobacco-free intervention program developed and administered by the AAFP for 4th and 5th graders. It includes an hour-long presentation given by University of Washington Medical Students on the harmful consequences of tobacco use, particularly the immediate consequences. To prepare for the presentations students attended a training led by students with prior Tar Wars experience. A discussion on approaches to presenting the material and how to deal with issues that may arise followed the training. Student leaders contact local schools (there is a list from previous years) to inquire on interest and scheduling. Leaders will then pair up and present at grade schools. There is a bin of supplies in the family medicine offices. Most of them are used over and over, such as pig lungs, simulated phlegm, and a model of a diseased mouth. Other items such as straws and post-its will be purchased by students as needed and then submit a receipt to the FMIG coordinator for reimbursement. Residents from a local family medicine residency program come to teach students about the discipline of sports medicine within Family Medicine. They review the indications for splinting and casting and trained students to apply short arm splints and casts. Student practiced casting on each other with guidance from the residents. Student leader should come inventory supplies at least a month before workshop in case any supplies need to be ordered. Most students want to practice casting so there should be a few splints on hand but most aren’t used. Stockinet, cast padding (3 and 4 inch), casting tape (3 and 4 inch), and chux are the most likely to be used so plenty should be on hand. Gloves, scissors, buckets are in the family medicine offices. Food – consult the budget for this event. Student leaders can help plan the food. Create a WeJoinIn for RSVPs – Cap the amount of students available to attend since each participant will need their own station. Arrange parking for the faculty and residents. Book a classroom through Classroom Services. Starts early November and runs until end of autumn quarter. This annual drive, sponsored by FMIG and the Community Health Advancement Program (CHAP), solicited donations of clothing and toiletry items that benefited local organizations that serve those suffering from homelessness. FMIG student leaders team up with CHAP students (recruited by the CHAP coordinator) to raise clothing donations for local shelters. Boxes are decorated and placed around the school of medicine for donations. Student leaders empty boxes weekly and store donations in family medicine offices. There are also bulletin boards outside E-304 that students can decorate advertising the drive. The FMIG coordinator emails MS1s, MS2s and the school of medicine employees advertising the locations to bring donations. At the end of the quarter there is a sorting party dividing donations amongst what the shelters need and then students bring them to the shelters. Students get large boxes (usually free from somewhere like Best Buy) and decorate them with holiday gift wrap. Gift wrap can be purchased by students and reimbursed by the FMIG coordinator. There is little to no cost for this event. Faculty and residents from a local family medicine residency teach medical students advanced musculoskeletal exam skills. The first 30 minutes are spent reviewing the exams followed by an hour of students practicing exams with each other under the guidance of the faculty and residents. All supplies for Seattle FMIG are brought by Tacoma Family Medicine and include models of the knees and joints. Faculty and residents from a local family medicine residency teach students various suturing techniques including simple and straight lacerations, deep layer closures, skin closures, and interrupted and mattress sutures. Students practiced these newly learned skills on pigs’ feet with guidance from the guest instructors. FMIG coordinator will order pig’s feet for the students to suture on. We usually get them from the QFC deli and have them split ankle to toe so each student gets half a hoof that won’t roll around on them. Make sure you tell the butcher you need them thawed! Since students will be working on animal parts there is NO FOOD for this event. Suture (usually donated but if not they can be ordered online for relatively cheap by getting expired sutures). Suture kits – one per student. Family Medicine residents from the Seattle area share their experience with residency from the application process through the end of third year. Students were encouraged to ask the panel questions and thoughtful discussions ensue. Student leaders will contact local residencies to recruit family medicine residents. Book a classroom or lecture hall through Classroom Services. Anything needed for food; plates, napkins, utensils, etc. Spring quarter; usually mid to late April. Faculty and residents from a local family medicine residency teach medical students a variety of hands on skills including vacuum assisted delivery, forceps assisted delivery, episiotomy repair, and fetal heart tone auscultation. Book two classrooms through Classroom Services; one for the main workshop and a breakout room for exams and pregnant women (usually recruited by the residency leading the workshop). All supplies for Seattle FMIG are brought by Group Health Cooperative and include birthing mannequins, models for perennial repair demonstrations, and 1-3 patients. Spring quarter; usually early April. Faculty and residents from a local family medicine residency teach medical students how to place leads, decipher EKG printouts and discuss irregular readings. Book two classrooms through Classroom Services; one to practice placing leads (and reading EKG if a machine is accessible), second room to review sample irregular EKG readouts. Supplies needed would be leads (usually purchased online), sample printouts of EKG readings for review containing a variety of different samples physicians may come across, and any food related supplies. This was in conjunction with the OBGYN Interest Group so we went with their timeline, which was late January. This was a first time event and hugely popular! A family physician that does OB gave a short introduction on IUDs and a tutorial on how to place the device. Students then got the chance to work with and learn how to place the device themselves under the guidance of a family physician and local residents. Create a WeJoinIn for RSVPs – Cap the amount of students available to attend depending on IUD kits available. IUD kits were obtained by the OBGYN Interest Group through a donation. FMIG provided food. Chair of the Department of Family Medicine presents on what it takes to be a competitive applicant to family medicine residencies. Create a WeJoinIn for RSVPs – Get as large a room as possible so as not to have to cap attendance. Book a lecture hall through Classroom Services with a projector for any slides presenter may want to show. A reception for fourth year students matching in family medicine co-sponsored by the King County Academy of Family Physicians (KCAFP) and the Washington Academy of Family Physicians (WAFP). First through third year medical students considering matching in family medicine are also invited to come and connect with their senior colleagues. Keynote speakers from the WAFP are invited to congratulate students on their match and future careers in family medicine. Book a local venue for this reception. We’ve used the Vista Café on UW Campus in the past. The last couple of years we’ve teamed up with the KCAFP’s annual meeting so have used their venue for a reception before the meeting.